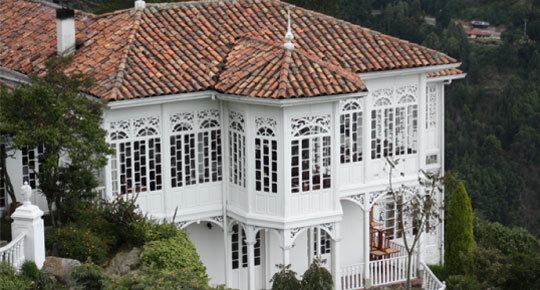 The Casa Santa Clara Restaurant is located on the Monserrate Mountain (Cerro de Monserrate). It gives the visitors the opportunity of enjoy a stunning view over Bogotá whilst take delight with the typical Colombian cuisine. This restaurant has an interesting history. The restaurant is run in a beautiful large house. The interesting detail is that the house was built in 1924 in the Usaquén district, in northeastern Bogotá. Then, in 1979, fifty five years later, the house was moved out to Monserrate, where it remains until today. The Santa Clara’s menu is specialized in Colombian typical dishes; however, you can also order pasta, fish and sea food or grilled dishes. Among the most traditional Colombian dishes are the Bandeja paisa (which includes beans, rice, ground beef, chorizo, chicharron, avocado, egg, fried banana slices and arepa anioqueña), the Flank Steak (served with chopped tomato and onion, with papas saladas and salad) or the Ajiaco, a typical soup of Bogotá made with a variety of potatoes, chicken and guascas and served with rice, avocado, heavy cream and capers. The pasta selection is also wide. You can enjoy fettuccini or spaghetti served in a variety of sauces: Carbonara (creamy sauce with white wine and bacon), Primavera (creamy sauce with sauteed vegetables: zucchini, carrots, peas and mushrooms) or Bolognesa (tomato-based sauce with herbs and ground beef). From the meat menu you cannot miss the pork loin in borojó sauce; the borojó is a tropical fruit that grows in the Chocó Department, in Colombia. Your fish and sea food options go from salmon to rainbow trout or catfish cooked in sauce. The selection of appetizers and desserts is also good, and even there is a children’s menu. Please don’t miss the Onces Santafereñas, a typical afternoon dish, made up of tamale, hot chocolate, bread, cheese and creams. In Casa Santa Clara you will enjoy a family atmosphere and a friendly and attentive service. HOURS: Tue - Fri: 12m - 6 pm. Sat: 9am - 5:30 pm. Sun: 9am - 4:30pm.